2nd Position of 118 P. V.
Organized at Philadelphia May 15-30, 1862. Moved to Baltimore, Md., August 31; thence to Washington, D.C. Attached to 1st Brigade, 1st Division, 5th Army Corps, Army of the Potomac, to April, 1864. 3rd Brigade, 1st Division, 5th Army Corps, to June, 1865. SERVICE.--Maryland Campaign September 6-24, 1862. Battle of Antietam, Md., September 16-17. Shepherdstown Ford September 19. At Sharpsburg until October 30. Movement to Falmouth, Va., October 30-November 19. Battle of Fredericksburg, Va., December 12-15. Reconnaissance to Richard's and Ellis' Fords, Rappahannock River, December 29-30. Burnside's 2nd Campaign, "Mud March," January 20-24, 1863. At Falmouth until April. Chancellorsville Campaign April 27-May 6. Battle of Chancellorsville May 1-5. Gettysburg (Pa.) Campaign June 11-July 24. Battle of Gettysburg July 1-3. Pursuit of Lee July 5-24. Wapping Heights, Va., July 23. At Warrenton and Beverly Ford to September 17, and at Culpeper until October 11, Bristoe Campaign October 9-22. Advance to line of the Rappahannock November 7-8. Rappahannock Station November 7. Mine Run Campaign November 26-December 2. At Beverly Ford until May, 1864. Rapidan Campaign May 4-June 12. Battles of the Wilderness May 5-7; Laurel Hill May 8; Spotsylvania May 8-21. Assault on the Salient May 12. North Anna River May 23-26. Jericho Ford May 25. On line of the Pamunkey May 26-28. Totopotomoy May 28-31. Cold Harbor June 1-12. Before Petersburg June 16-18. Siege of Petersburg June 16. 1864, to April 2, 1865. Jerusalem Plank Road June 22-23, 1864. Weldon Railroad August 18-21. Poplar Springs Church September 29-October 2. Boydton Plank Road, Hatcher's Run, October 27-28. Warren's Expedition to Hicksford December 7-12. Dabney's Mills, Hatcher's Run, February 5-7, 1865. Appomattox Campaign March 28-April 9. Lewis Farm, near Gravelly Run, March 29. Junction of Quaker and Boydton Roads March 29. White Oak Road March 31. Five Forks April 1. Appomattox Court House April 9. Surrender of Lee and his army. March to Washington, D.C., May 1-12. Grand Review May 23. Mustered out June 1, 1865. Regiment lost during service 9 Officers and 132 Enlisted men killed and mortally wounded and 1 Officer and 111 Enlisted men by disease. Total 253. Many of the officers and men had served in the three months' campaign, under Patterson, and in the summer campaign of 1862. Besides furnishing all the material aid for recruiting the regiment, the Corn Exchange gave each enlisted man a bounty of ten dollars. On the 31st of August, the day after being mustered into the United States service, orders were received from Adjutant General Thomas, for the regiment to report to General Wool, in command at Baltimore, where, upon its arrival, it was directed to proceed to Washington. Encamping first at Fort Albany, and subsequently at Fort Corcoran, it was, on the 12th of September, assigned to the First Brigade, First Division, of the Fifth Corps, and marched at once on the Maryland campaign. Passing Silver Springs, Rockville, Irederick, and Middletown, it arrived at the Antietam Creek on the evening of the 16th. During the battle of the 17th, it was held in reserve, and suffered but slight loss. On the 18th, it was sent forward on picket in front of the Burnside Bridge, and on the evening of the 19th, moved to the banks of the Potomac. On the following morning, the division crossed at Blackford's Ford, with the design of proceeding to Shepherdstown. It was scarcely over, when the enemy was discovered advancing upon it in heavy force. The regiment was at once ordered by the commander of the brigade to take position along the bluff. 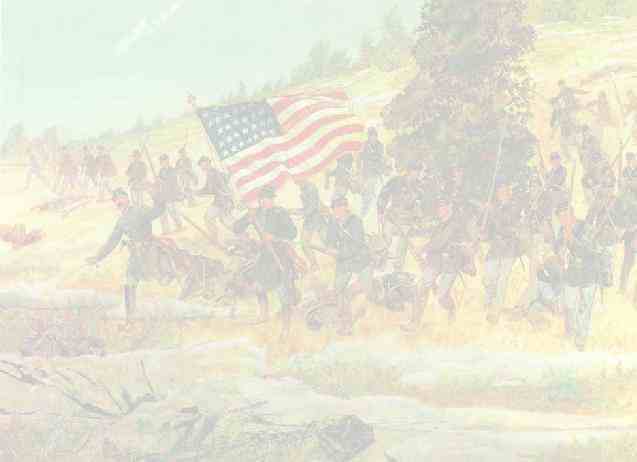 The first company, on gaining the summit, was deployed as skirmishers, and the rest of the regiment quickly formed. But before the line was perfectly established, the skirmishers were driven in, and an engagement commenced, the enemy coming on in overwhelming numbers. Unsupported, and receiving a concentrated fire from front and flank, the command was subjected to a trying ordeal. Colonel Provost, while carrying the colors to the front, to check a momentary wavering of the line, was severely wounded and carried from the field. The command then devolved upon Lieutenant Colonel Gwyn, who held his position until ordered to re-cross the river, which was accomplished under a galling fire from the triumphant foe, who pressed quickly forward and swarmed on the bluffs. Nearly all of the wounded, and about ninety men beside, fell into the hands of the enemy, and all the dead were left upon the field. The loss in the engagement was sixty-four killed, one hundred and twenty-four wounded, and ninety-four missing; an aggregate of two hundred and eighty-two out of about eight hundred, who crossed the river on that disastrous day. Captains Courtland, Saunders, and Joseph W. Ricketts, and Lieutenants Mora Moss, and J. Rudhall White, were among the killed, and Captain Callaghan, Lieutenants M'Keen, Lewis, and Smith, and Adjutant Perot, were among the wounded, the latter, with Lieutenant Hand, among the prisoners. For gallantry in this engagement, Colonel Provost was brevetted Brigadier General. Until the close of October, the regiment remained in Maryland, engaged in guard and picket duty. It then crossed the Potomac, and moved with the army through Virginia, going into camp at Hartwood Church, and at a point near Potomac Creek, where it remained until the opening of the Fredericksburg campaign. On the 1st of December, it accompanied Averell's Cavalry on a reconnoissance on the Hartwood Road, returning on the following morning. On the 11th it moved at seven A. M., with the division, to a point on the Rappahannock opposite Fredericksburg, where it remained under arms during the bombardment of the city, which lasted the entire day. At night it moved back a mile, and bivouacked near White House. On the following morning it again moved to the front, and at two P. M., on the 13th, the pontoons in the meantime having been successfully laid, it crossed the river, and, passing through the streets of the city under a heavy artillery fire, was ordered to advance upon Marye's Heights, which the divisions of French and Hancock had vainly attempted to carry. The heroic efforts of this division proved alike unsuccessful. For though it was spared for a time from the enemy's artillery fire, owing to the fact that his batteries, at the moment:of advance, were in the act of being relieved, yet when it approached within range of his infantry, it met such sheets of flame as no power could stand against, the most violent cannonading from the Union batteries having produced no effect upon his impregnable front. The regiment remained in line of battle under a heavy fire, during the remainder of the afternoon and the entire night succeeding. On the 14th it was still held under fire, but at night retired to the river bank, where it bivouacked and remained until seven o'clock on the morning of the 16th, when it re-crossed the river, and returned to camp near Falmouth. The loss in the engagement was seven killed, forty-three wounded, and sixteen missing. Major Herring was among the wounded. On the 30th, the regiment participated in a reconnoissance, which extended to Richardson's and Ely's fords, skirmishing lightly by the way, and returning to camp on the afternoon of the 1st of January, 1863. A committee of the Corn Exchange arrived that evening, brninging numerous packages prepared by kind hands at home. On the 20th of January the regiment again broke camp and moved out on the United States Ford Road, the whole army in motion. On the 23d, the roads becoming impassable, a return to camp was ordered, and for two days the regiment was engaged in building corduroy roads for the rescue of the trains from the mud. On the 19th of April, Colonel Provost, who had been absent since receiving his wound at Shepherdstown, returned and assumed command. On the 27hth the regiment moved on the Chancellorsville campaign, bivouacking at night near Hartwood Church, on the night of the 28th, near Kelly's Ford, crossing the Rappahannock at mid-day, the Rapidan at evening, and bivouacking that night on the bluffs above the ford. At eleven A. M., on the morning of the 30th, it arrived at Chancellorsville, and immediately joined in pressing the enemy, driving him back two miles, and capturing his pickets. At two P. M., it came upon the enemy in strong force in position six miles from Fredericksburg. The division was ordered to retire, and returned to a point near the Chancellor House, where it bivouacked for the night. At eleven A. M., of the 1st of May, the fighting commenced. In the afternoon, the brigade to which the regiment was attached was sent on a reconnoissance towards Banks' Ford, but returned at evening to the Chancellor House, where, during the night, it was exposed to a heavy artillery fire. At two A. M., of the 2d, it moved out upon the road leading to Banks' Ford, and was set to work throwing up breast-works, its first experience in digging, at which it was kept busily engaged during the entire day. At dark it was moved at double-quick towards the Chancellor House, the Eleventh Corps holding the right of the line, having been driven from its position by the fierce onset of Stonewall Jackson's men. It remained during the entire night in line behind breast-works, engaged under a heavy infantry and artillery fire. Early on the morning of the 3d, it was moved to the United States Ford Road, and at eight was placed in line with the Sykes' Division, where it was employed in throwing up breast-works At mid-day it was taken to the Chancellor House, where it was in line of battle supporting artillery for an hour, exposed to a heavy fire. Moving to the rear, at two P. M., it rested a short time, and at dusk moved into breast-works at Barns' House. During the 4th it remained in breast-works under a constant fire from the enemy's sharpshooters, until five P. M., when the brigade supported an advance of the Second and Third brigades upon the enemy's lines. On the 5th, the greater part of the regiment was on the picket line under command of Major Herring, and at night the army began to retire across the river. At daylight of the 6th, the pickets of the regiment retired, and with detachments of other regiments acted as skirmishers. It crossed at United States Ford, at nine A. M., and was engaged all day in the laborious duty of taking up the pontoon bridges, the stream greatly swollen by recent rains. In the evening it returned to its former camp. The loss in the engagement was ten wounded, and seven missing. On the 25th of May, Colonel Provost left the regiment to take command in the Invalid Corps, and was subsequeutly honorably discharged as Colonel. The regiment remained here engaged in the usual camp and guard duty, until the 10th of June, when it started north for the campaign in Pennsylvania. At Aldie, Middleburg, and Upperville, it supported the cavalry, the enemy being driven into the fastnesses of the mountains, and on the 30th arrived, after a hard day's march, at Union Mills, Maryland.' At ten A. M., of the 1st of July, it crossed into Pennsylvania, the men exhibiting the greatest enthusiasm on reaching the soil of their own State, bivouacking at four P. M., at Hanover. At nine P. M., it having been decided by the commanding General to concentrate the army at Gettysburg, where the First and Eleventh Corps had been hotly engaged, and deliver a general battle, the march was resumed, and on the morning of the 2d, it reached the field. It was held in reserve in rear of Cemetery Hill, until four in the afternoon, when the enemy attack ing Sickles' Corps, posted on the extreme left, with great fury and overwhelming force, the Fifth Corps, now commanded by Sykes, was hurried to Sickles' support, the regiment becoming hotly engaged, and losing two killedn five wounded, and two missing, Captain Richard W. Davids being of the killed, and Lieutenants Wilson and Inman of the wounded. The men slept on their arms in line during the night, the enemy being completely checked. At seven A. M., of the 3d, it was moved to the left, near to the summit of Round Top, where it remained behind breast-works, undisturbed, except by the enemy's sharp-shooters, until the close of the battle. At ten on the morning of the 4th, it moved out to reconnoitre, and became warmly engaged, the enemy keeping up a show of strength upon his skirmish line, to screen his retreat, which was now in full progress. The foe was followed up as far as the Potomac, but with little success, he escaping across the river on the 13th. Returning across South Mountain, the regiment crossed the Potomac with the army at Berlin, and returned to the neighborhood of Warrenton, where on the 6th of August, one hundred and nine recruits were received, and on the 15th of September, one hundred and eighty-five more. In the advance to the Rapidan, which now followed, and the manceuverings for an advantage, which brought the army back to Centreville, and again carried it forward to Mine Run, where, standing amidst the frosts and chilling December blasts, Meade wisely declined to attack the enemy in his well chosen and fortified position, the regiment shared the fortunes of the corps, being in line of battle in the action at Bristoe Station, on the 14th of October, and losing six missing; in the action at Rappahannock Station, on the 7th of November, losing two wounded, and at Robinson's Tavern and Mine Run, on the 28th, 29th, and 30th of November, losing one killed, and two missing. On the 4th of December, the regiment went into permanent winter-quarters near Beverly Ford. On the 31st, Lieutenant Colonel Gwyn was mustered as Colonel, Major Herring, as Lieutenant Colonel, and Captain Henry O'Neill, as Major, these officers having been previously commissioned to these grades, to date fiom the 30th of September. On the 1st of May, 1864, after having remained during the winter in comparative quiet, the regiment broke camp and started for the Wilderness. The following extract from the eleventh annual report of the Corn Exchange Association, will show the part borne in this sanguinary battle: " May 5. Early in the morning, enemy found in front. At 8 A. M., built breast-works. At 12.30 P. M., moved forward and charged the enemy, Colonel Gwyn in command of the second line of the brigade, Twentieth Maine, and One Hundred and Eighteenth, Lieutenant Colonel Herring commanding the regiment. Engagement very sharp, heat oppressive. At 1.30 P. M., obliged to retire to the breast-works, by reason of the enemy moving upon our flanks in force. Colonel Gwyn wounded and carried off the field. At 5 P. M., moved to the front again, and at 7 P. M., retired to breast-works to bivouack for the night. Killed, two; wounded, twenty-six; missing, twenty-seven. May 6. At 3.30 A. M., moved out to the front, formed line of battle in the woods near the enemy. Brigade in three lines, Sixth Corps connecting on the right. Under sharp fire all day. At 6 P. M., retired to the breast-works, and rested for the night. May 7. At 6 A. M., attacked by the enemy, who was repulsed. At 10 A. M., Lieutenant Colonel Herring in command of three regiments, including the One Hundred and Eighteenth, charged the enemy, pressed him back to his works, and established a picket line. At 8 P. M., army moved towards Spottsylvania. Wounded, ten; missing, one. May 8. Moved at 1, A. M., with a detachment under Lieutenant Colonel Herring. Withdrew pickets and acted as a rear guard. At 10 A. M., reached Laurel Hill, near Spottsylvania Court House. Found the army engaged, and was sent to support a part of Crawford's Division. At 5 P. M., moved forward with Crawford and became hotly engaged. Killed, five; wounded, twenty-four; missing, one. May 9. Retired quietly at 3 A. M. Re-joined the brigade at 8 A. M., and bivouacked for the day. May 10. Moved at 4 P. M., out to front of breast-works at Peach Orchard, to make a charge. Orders for a charge countermanded. Bivouacked at 8 A. M. Lieutenant Coane, wounded. Killed, one; wounded, one. May 11. Under fire of the enemy's artillery. Lieutenant Thomas wounded and sent to the rear. May 12. Moved at 3 A. M., to the extreme right of the army, to act as skirmishers on the flank. Crossed the River Po in conjunction with the army. Exposed to artillery fire. Killed, one; wounded, three; missing, one." A series of movements by the left flank followed, which finally brought the army to the city of Petersburg, south of the James, in which the two hostile forces were kept facing each other, some portions almost constantly in collision, the fighting at times being terrific. In these movements the regiment participated, losing in the action of the 18th, one killed, on the 22d, near Bowling Green, one killed, and one wounded; on the 23d, at North Anna River, one wounded, and again at the same place, on the 26th, two wounded, on the 30th, near Mechanicsville, one killed, on the 1st of June, four wounded, on the 2d, at Bethesda Church, four wounded, and eighty-six taken prisoners while on the skirmish line, Captain Kelly and Lieutenant Crossley being of the number, and on the 4th, Lieutenant Ware mortally wounded. On the 16th, the regiment crossed the James, and moved up to the front near Petersburg, and was immediately engaged, the enemy being driven slowly back, and the Union troops throwing up works to hold every inch of ground gained. In the movement of the 21st, the regiment lost one killed, and six wounded. From this date until the middle of August, the regiment remained in the trenches, under fire day and night, from mortars, rifles, and cannons, living much of the time in bomb-proofs, and engaged in building fortifications and in picketing. On the 15th of August the regiment retired from the trenches, and joined in the movement upon the Weldon Railroad, Colonel Gwyn in command of the Third Brigade, Lieutenant Colonel Herring in command of the regiment. At ten A. M., of the 18th, line of battle was formed near Gurley House, and at noon the road was occupied, manceuvring and fighting continuing throughout the day. On the 19th, the enemy made a heavy attack upon the right, and the regiment was moved at double-quick to the front, and took part in restoring the lines. On the 21st the enemy again attacked in strong force, coming up in several lines of battle, but was repulsed with great loss, the engagement lasting an hour. The loss of the command was one killed, one wounded, and twenty missing. The regiment remained in breast-works near the Yellow House, picketing and building forts until the morning of the 30th of September, when it moved out to the front, and joined in driving the enemy's pickets, charging and carrying a fort and line of the enemy's works. At four in the afternoon, it moved to the support of troops of the Ninth Corps, which had been driven in. The engagement became warm, and lasted two hours. The position was held, and the enemy repulsed with great slaughter. The loss was seven killed, and twenty-six wounded, Lieutenant John Canahey being among the former, and Captain Young, and Lieutenants Seesholtz, Scott, and Conner, among the latter. Captain Young's wound proved mortal. Colonel Gwyn had his horse killed under him, and was disabled by the fall. With the exception of the movement to Hatcher's Run, on 27th of October, and that to Jarratt's Station, for the destruction of the Weldon Railroad, on the 8th of December, the regiment remained in the works near Pegram's Farm, and in camp near the Gurley House, until the 5th of February, 1865. On the latter day, breaking up winter-quarters, the corps moved upon the Halifax Road, crossed Hatcher's Run, and at half-past four attacked the enemy. In the action which ensued, known as Dabney's Mills, the regiment suffered severely in loss of officers. Captain John Scott was killed, and Colonel Herring and Captain Bayne, severely wounded. Colonel Herring had a horse killed under him, and subsequently lost a leg as a result of his wounds. For his gallantry in this action, he was brevetted Brigadier General. On the 25th of March, a general movement of the army was inaugurated, which resulted in the practical overthrow of the rebellion. Learning that the enemy had struck at Fort Steadman, Grant ordered a general attack along his whole line. The regiment was early in motion, and at 5 P. M., became hotly engaged. The fighting ceased at dark, and it returned to camp. On the 29th, it was again early in motion, and at three P. M., General Chamberlain's Brigade became engaged at Lewis' Farm. Two hours later, the One Hundred and Eighteenth was advanced as skirmishers, charging the enemy's skirmish line, crossing the Boydton Road, and remaining on picket during the night. The loss was two wounded. On the 31st, the Second and Third Divisions were attacked and driven back upon the First, which became sharply engaged, but succeeded in holding its position, and compelling the enemy to retire. In this encounter, the regiment lost one man killed, and two officers and five men wounded. In the afternoon the division moved to the left to join Sheridan's Cavalry, but, unable to reach him, it returned at midnight and rejoined the corps. On the following morning, April 1st, the corps moved early, and was engaged during the day in the battle of Five Forks. The pursuit of Lee's army, which was now in full motion, was vigorously pushed. Passing Sutherland Station, Jettersville and Amelia Court House, the corps crossed the Appomattox on the 7th, and on the morning of the 9th, formed in line of battle for an attack. As it moved forward, and had already come under artillery fire, a rebel officer was discovered bearing a flag of truce and a message from General Lee, asking terms of surrender. On the following day, the tidings of the consummation of the surrender were heralded to the army, amidst general rejoicing. Early on the morning of the 12th, this brigade, which had been selected to receive the rebel arms and colors, moved out, when eighty-four battle flags, and fifteen thousand muskets were laid down in its front. Remaining in camp until the 15th, the homeward march was commenced. Passing through Richmond and Fredericksburg, it arrived in the vicinity of Washington, on the 12th of May, where it went into camp. On the 23d it participated in the grand review at the Capital, and on the 1st of June was mustered out of service. Returning to Philadelphia, it was paid, and on the evening of June 9th, was entertained at a grand banquet given at the Sansom Street Hall, by the Corn Exchange Association, at which Generals Meade, and Patterson, and other distinguished guests were present. On the following day, it participated in the review and reception of returned Philadelphia Volunteers, when it was finally disbanded.